Creative room dividers provide elegant form and function. 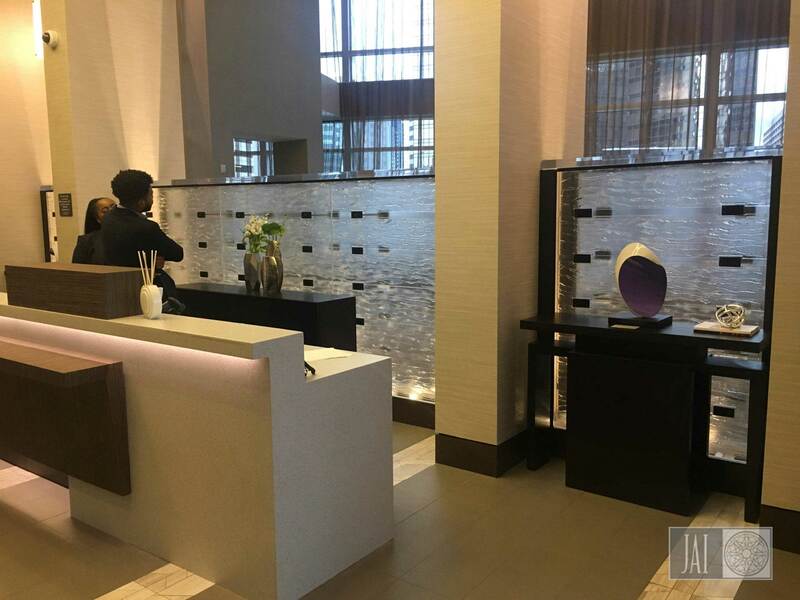 Cast glass walls were the perfect solution when the Marriott Residence Inn Charlotte, NC needed to create a visual interruption between their hotel lobby registration desk area and adjacent library. Light transmission was important to give the installation the sense of openness desired, so decorative dividers of custom kiln formed low-iron cast glass panels were created to form the wall. 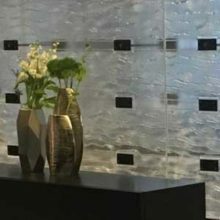 There are a total of ten 72-inch high by 53-inch wide art glass panels installed in a double wall configuration situated between existing columns. LED up lighting is concealed in a structural wood base with access panels designed to service the lighting fixtures. There are five back-to-back sections of cast glass walls, with a 12-inch separation to accommodate the LED up lighting. Glass walls are capped with 14-inch wide by 2-inch thick clear Plexiglas. Field measurements were provided by the general contractor. 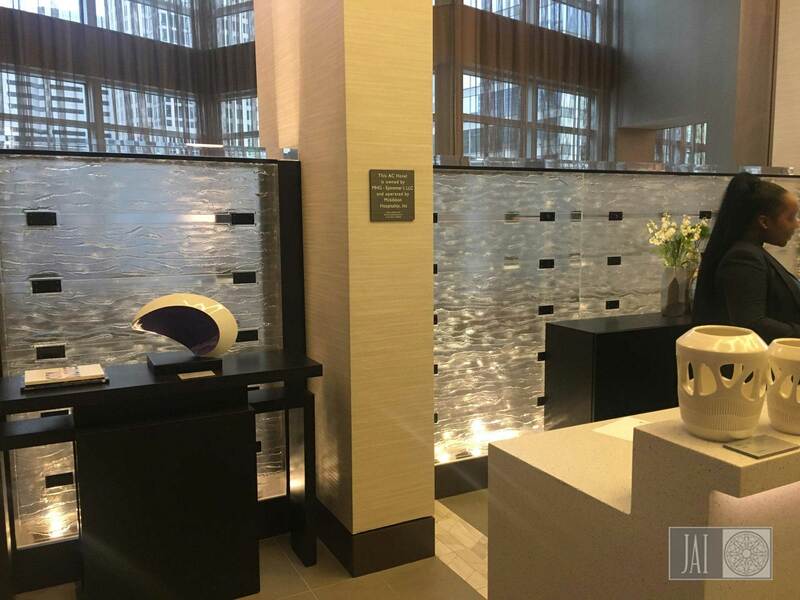 Shop drawings were produced by Jancik Arts International, Inc. for approval, and then the glass panels were manufactured to specs. 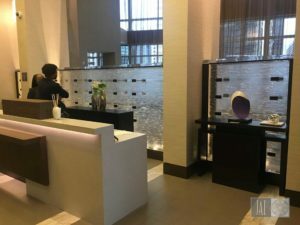 Our client, LPBC Architects, suggested accent 2-inch by 4-inch by ¼-inch thick plates with decorative rivets be adhered to the face of the glass as an additional point of interest. Also provided, matching bronze finished aluminum vertical plates for the connection to the columns. The cast glass wall pairs are supported in the middle with a custom bronze finished stand-off system. Lead time is important in any project, and with two weeks required for shop drawing submission, followed by a two week sample submission for approval, and a four week production schedule for the cast glass wall panels to be created, crated, and shipped, this was an efficient and elegant solution. Categories: Cast Glass and Installations.